“The Syrian Arab Republic is encouraged to expedite systematic, predictable and high-volume movements to complete the safe removal of chemical materials,” the OPCW-UN joint mission said in a note to journalists. Accompanied by naval escorts from China, Denmark, Norway and Russia, the Norwegian cargo vessel ship is sailing for international waters where it will be met by British naval escorts. In addition, Finnish experts are onboard the Danish vessel. Also today, the OPCW-UN mission confirmed that in-country destruction of some chemical materials has taken place. The removal of the chemical agents out of the country involves transporting them to the port of Latakia and onto commercial vessels provided by some Member States. They are then loaded onto a United States ship and will be destroyed at sea using hydrolysis. In accordance with the decisions of the Security Council and OPCW Executive Council, Syria’s chemical weapons are being transported outside its territory to ensure their destruction in the “safest and soonest manner,” and no later than 30 June 2014. 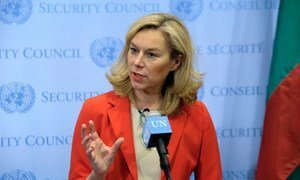 Despite delays reported by Joint Mission Special Coordinator Sigrid Kaag, Secretary-General Ban Ki-moon voiced hope last week that the 30 June target date for completion would be met. The Mission said that it “welcomes progress to date” and reiterated its continued close working relationship with the Syrian Government and Member States to implement Security Council Resolution 2118 and decisions of the OPCW.